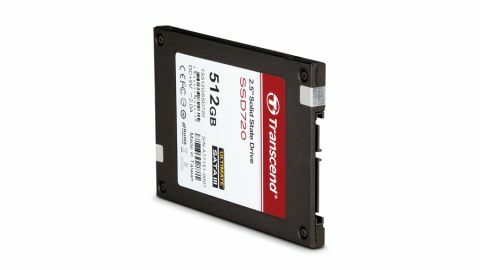 Is this SandForce based SSD getting a bit long in the tooth? Transcend. Never heard of it? Actually, it's been in the memory game for longer than most, and was one of the very first outfits to flog solid state drives aimed at punters with PCs rather than just to big business. Indeed, dig a little deeper and you'll find that the insides of the Transcend SSD720 series are pretty familiar. Perhaps a little too familiar. The controller chipset is none other than the SandForce SF-2281. Of course, you might think it's a bit rich to talk about the SF-2281 as though it's at death's door. It's wasn't all that long ago we were hailing it as the greatest advance in solid state technology since the vacuum tube. The problem is, progress is relentless, as is our understanding of what makes for a good SSD. And now we know that the SF-2281 has certain shortcomings. Notably, it delivers its impressive peak performance numbers beyond the 500MB/s mark courtesy of data compression. Which is clever, except that much of the data you shunt around, like images and music and video, isn't compressible. That explains why the Transcend SSD720 drops from 456MB/s to 259MB/s when you compare compressible and incompressible sequential write performance. That said, even 259MB/s is probably good enough in subjective computing terms. Instead, it's the mediocre 4K random performance that really puts us off this drive. It's a metric where we'd like to have much more performance than even the fastest drives can manage, so the fact that the SSD720 is well off the pace, especially for 4K random writes, is approaching deal-breaker territory.